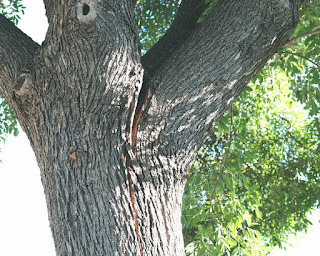 My neighbor recently brought a concern to my attention that my tree had a giant crack in it. After further investigation it had not one but 3 splits in the tree. It looked really bad like it would split and fall 3 different ways before the end of the day. This could end very badly causing extensive damage to our property that would be very expensive to fix. 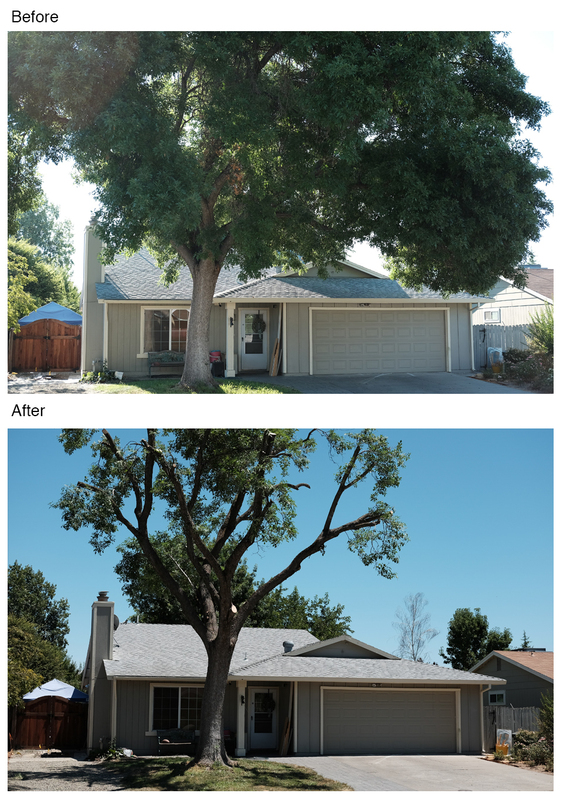 Our tree is located in our front yard and is a 40+ year old Modesto Ash. 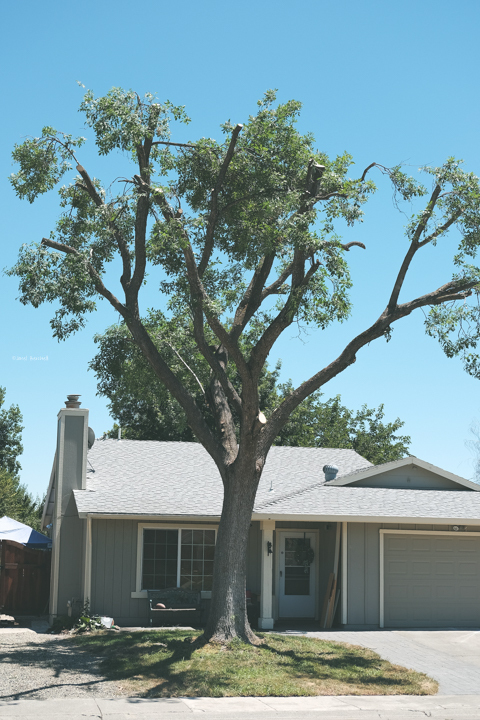 40 years ago it was common to plant Modesto Ash trees in new housing communities around this area. Unfortunately the Modesto Ash is prone to disease and mistletoe. 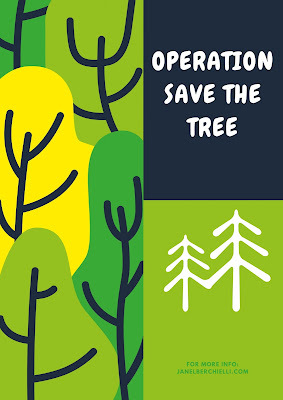 Many of these trees have since then been removed from the area. Our tree provided at least 50% shade to our house. We thought for sure this was the end for the tree. 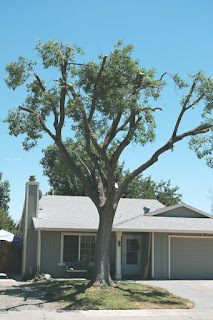 We contacted several different tree removal companies but only one was available to come right away. After the assessment the tree company felt it was possible to save our tree. The tree crew came early the next day with and "Operation Save the Tree" began. They started by drilling holes into the tree and placing large bolts in a total of 3 places. 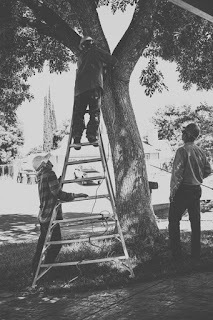 Then they proceeded to trim the heavy branches off the tree. At first we were told they would only have to remove 25% of the tree branches, but it turned out more than that was needed to be removed. It took the crew 3 hours, which isn't bad considering how much work they had to do. Our tree was very tall and had lots of thick branches. Once they were finished the tree didn't look pretty. I was assured by the tree company the tree should heal itself and a year from now the regrowth of the branches will make the tree look nice again. We ended up spending quite a bit of money to help save the tree but hopefully with time it will once again provide shade to our home and last another 40 or more years.